Director – Chuck Russell, Screenplay – David Hayter, Will Osbourne & Stephen Sommers, Story – Stephen Sommers & Jonathan Hales, Producers – Sommers, Stephen Sean Daniel, James Jacks & Kevin Misher, Photography – John R. Leonetti, Music – John Debney, Visual Effects – CFX/Das Werk (Supervisor – Rodney Ishiwara) & R!iot (Supervisor – Bon Wiatr), Special Effects Supervisor – Larz Anderson, Makeup Effects – W.M. Creations Inc, Production Design – Ed Verreaux. Production Company – Alphaville/Stephen Sommers Pictures/Misher Films. The Akkadian mercenary Mathayus is hired by a group of tribes that are besieged by the ruthless warlord Memnon. Memnon has been made invincible by his sorcerer who sees the future and guides his actions and the tribes want Mathayus to eliminate the sorcerer. Mathayus infiltrates Memnon’s camp, only to discover that the sorcerer is a beautiful woman Cassandra. He is captured and left for dead. Escaping, he makes his way to Memnon’s city Gomorrah, determined to kill Memnon for slaughtering his brother. Instead, he abducts Cassandra and flees into the desert. There he rallies the other kingdoms to take on Memnon, even though Cassandra has foreseen that it will end in bloodshed. The Scorpion King was a spinoff from The Mummy Returns (2001). 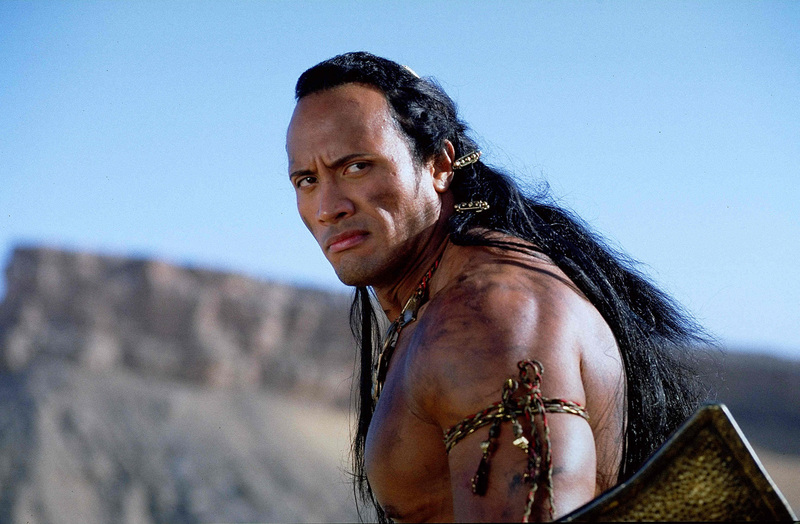 In The Mummy Returns, the Scorpion King was a character played by Dwayne Johnson back when he was still billing himself as The Rock who briefly appeared in the first five minutes leading armies and then again at the end as a stop-motion animated scorpion-man. The Rock apparently so impressed the producers with his screen presence that they quickly crafted this vehicle for him set around the character of The Scorpion King. At that point, The Rock was the most popular of the wrestlers in the WWF/WWE empire. On tv, The Rock had a natural ability to coin instantly quotable one-liners – “Can you smell what the Rock is cooking?” – and unique moves – The People’s Elbow – and make everything he did into a perfectly chiseled profile shot. He became an enormous fan favourite with both the younger generation and female audiences. Subsequent to The Scorpion King, Dwayne Johnson went on to craft a growing presence as an action hero and then A-list star. Although Mummy series director Stephen Sommers writes and produces The Scorpion King, the director’s chair has been turned over to Chuck Russell. Russell has previously made the likes of A Nightmare on Elm Street III: The Dream Warriors (1987), the remake of The Blob (1988), the Jim Carrey superhero film The Mask (1994), the Arnold Schwarzenegger action film Eraser (1996), the occult flop Bless the Child (2000) and the subsequent I Am Wrath (2016). While none of Chuck Russell’s films are particularly standout, common to all of these is Russell’s interest in state of the art special effects, so it is no particular surprise that he has been asked to step into Stephen Sommers’ shoes for The Scorpion King, considering how the Mummy films were almost entirely driven by special effects. 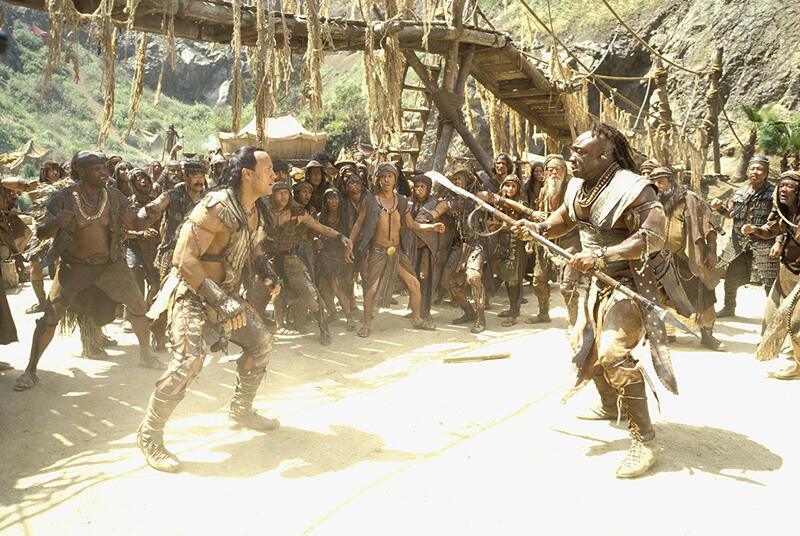 The surprise with The Scorpion King is that, unlike the Mummy films and considering Chuck Russell’s penchant for effects, the film is rarely driven by effects set-pieces. In fact, outside of the sorceress, there is very little about The Scorpion King that is fantasy at all. While clearly effects have been used to create cities, armies and swarms of scorpions, here they are employed in the service of enhancement instead of the gratuitous wonderment they are in the Mummy films. Rather the set-pieces that Chuck Russell creates here are centered around the inherently non-fantastical stuff of sword battles, chases through the palace, stalkings in gloomy caverns, armies on the attack and so on. As such, Chuck Russell is actually a better a director than Stephen Sommers in either Mummy film – The Scorpion King is not infected with the campy unserious silliness that underlies all of Sommers’ action set-pieces, nor the perpetual straining to bombard the audience with CGI amazement. While The Scorpion King never plays much above the level of an action movie cartoon, Chuck Russell at least takes it relatively seriously. Certainly, The Scorpion King is never more than a mediocre film. While Chuck Russell sets the action up with competence, there is not much a plot holding it together. It stirs a few sword and sorcery cliches but the average Italian Conan the Barbarian (1982) ripoff of the 1980s does these much more energetically. Most irritatingly, the plot skips over the title. There is a brief scene where The Rock is stabbed with an arrow dipped in scorpion venom but outside of that there is no explanation of how he ended up as the scorpion hybrid we saw in The Mummy Returns. Of course, the dictates of movie heroism require that the film end on an upbeat note and so rather than seeing him turned into a scorpion creature the show ends with him killing the villain, winning the girl and inheriting the kingdom. In terms of the promised origin story of the Scorpion King, the film is a complete cheat. The Rock makes for a likeable hero – he certainly has more natural charisma than Arnold Schwarzenegger did in either of his Conan outings. However, the role is extremely one-dimensional – The Rock is never required to do more than narrow his eyes in grim determination or occasionally smile and give his trademark quizzically curled eyebrow. Among the rest of the cast, Kelly Hu is beautiful but vapid. British actor Steven Brand projects a strong tightly bound presence as the villain of the show. Grant Heslov gives a performance that is like a bad racial caricature of an Indian. There have been three dvd-released sequels:- The Scorpion King: Rise of a Warrior (2008), a prequel where The Rock was replaced by Michael Copon; The Scorpion King 3: Battle for Redemption (2012) and The Scorpion King 4: Quest for Power/The Scorpion King: The Lost Throne (2015) both featuring Victor Webster in the title role; and Scorpion King: Book of Souls (2018) with Zach McGowan.